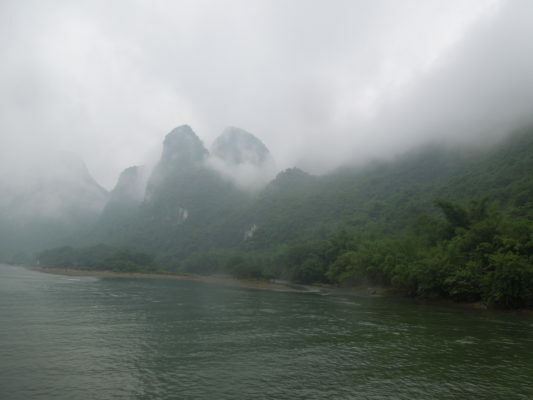 Guilin and Yangshuo are cities in Guangxi Province in the southwest of China. 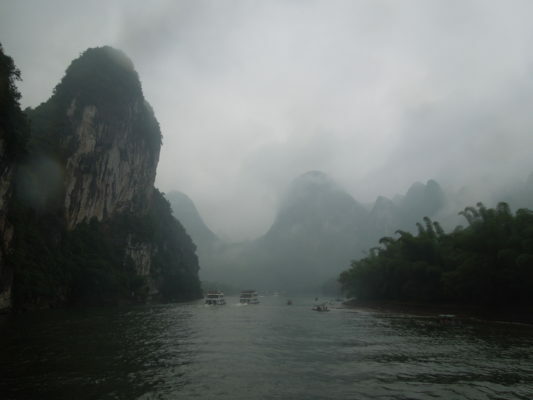 They are known for their fascinating landscapes, most notably the weathered limestone formations called karsts. Stone mountains covered in lush green vegetation, they randomly dot the land, suddenly rising and falling steeply for miles around. 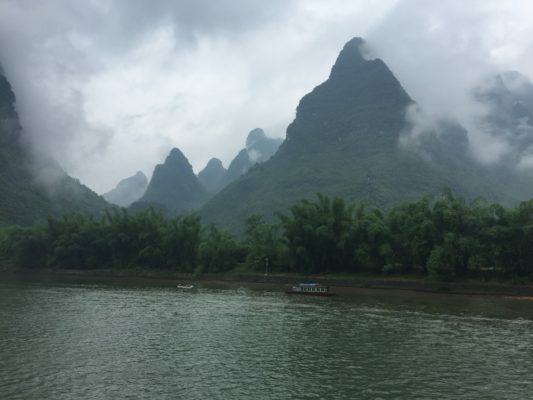 The Li River cruise is a four hour excursion beginning in Guilin and ending in Yangshuo, the purpose of which is to marvel at these natural creations that line the river. On the day I took this cruise it was raining. The wind was blowing hard enough to continually turn my umbrella inside out while I stood on the top deck being mesmerized by the fantastical shapes. While the experience would have been entirely different had the sun been shining brightly and the sky a clear blue, what I loved so much was the mist billowing between and around the karsts, giving the scenery a moody, mysterious feeling. I couldn’t look away, the girth and height and proximity of one to another constantly changing. There are two departure terminals, one for Chinese-speakers; the other for foreigners. One hundred boats each carrying one hundred passengers make this trip each morning, whatever the weather. The river is full of other boats too, water taxis and smaller sight-seeing vessels. 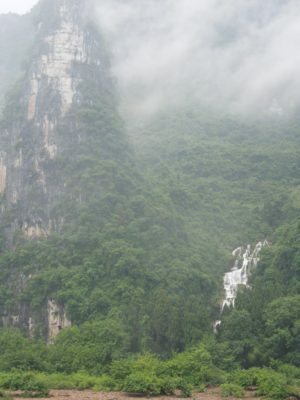 Waterfalls come rushing down the mountainsides. All of it is magical, different from any scenery I have previously seen. Fabulous photos. 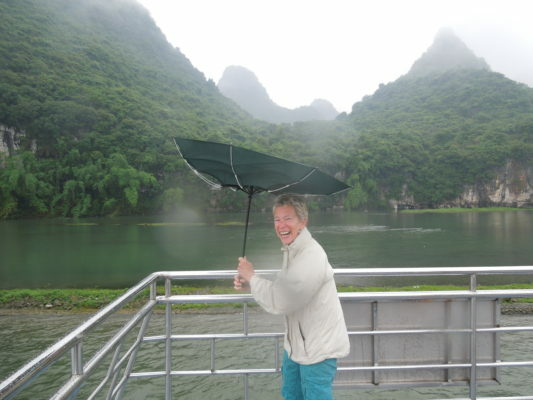 I’m enjoying your China blog, especially our Great Wall hiking adventure. You took great notes. Adele, great photos from your trip to china! It sounds like a wonderful trip. Keep them coming! You are making Chyna look extremely tantalizing! How wonderful that you get to experience all this amazing travel! Totally in joying your engaging travel writing!